Choose appropriate mathematics to solve a non-routine problem. Generate useful data by systematically controlling variables. Develop experimental and analytical models of a physical situation. Before the lesson, students watch a video of Rolling Cups. They then work on a related task designed to assess their current approaches to modeling. You collect and review students’ work and write questions to help improve their models. During the lesson, students first work individually to review their initial work. They then work in pairs to compare their approaches to the task, choosing a strategy that will produce an improved model and together implement that strategy. Students next review some sample work before discussing as a class the strengths and weaknesses of different approaches to the modeling task. In a follow-up lesson, students review their work on the task. 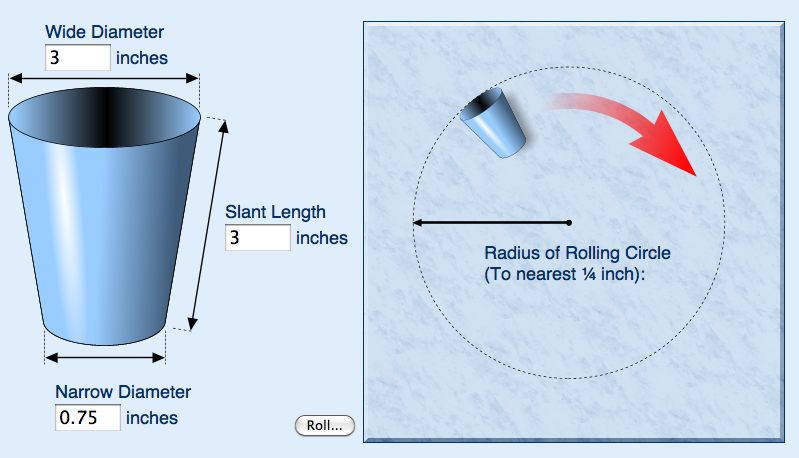 Each student will need a copy of the task sheet: Modeling Rolling Cups. Each pair of students will need a fresh copy of the task sheet, Modeling Rolling Cups, copies of each of the Sample Responses to Discuss, a large sheet of paper, and a felt-tipped pen. It is desirable that each pair of students has access to a computer with the applet Modeling with Geometry: Rolling Cups. If this is not possible the lesson can still be conducted with one class computer and a data projector. Supply paper and plastic cups, rules, scrap paper, graph paper, protractors, string, chalk, glue, scissors, and calculators for students who choose to use them. For the whole-class discussions, you will need a computer with data projector and two plastic/paper cups that have different base diameters and heights. 30 minutes before the lesson, a 90-minute lesson (or two 50-minute lessons), and 20 minutes in a follow-up lesson. All timings are approximate and will depend on the needs of your students.